In this roundup of some of the Magazines & Blogs are in Dutch others are written in English. Below each of the screenshot there is language information, please enjoy this list of Dutch Graphic Design Magazines & Blogs, share your favorite Dutch Design blog in the comments below. Thank you and enjoy reading! 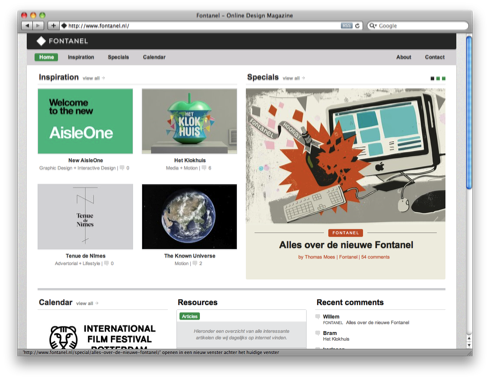 Fontanel is one of Hollands largest blogs and online magazine about design and graphic design. Operated by three very enthusiastic Dutch Designers, Thomas Moes, Erik Gelderblom and Willem van Roosmalen, which share on a daily basis their design news and philosophy. Recently Fontanel is redesigned with a complete new look and feel which allows you to really focus on the content and encourage you to read more. Fontanel focuses on design, typography, graphic design, art and will show you inspiration from other design magazines. They also host a calendar with up-to-date Dutch Design Information. 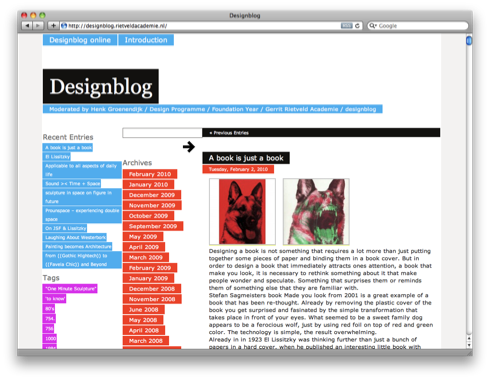 Designblog is an online research project initiated by Henk Groenendijk. It is part of the Foundation Year’s design program and stimulates interaction between the design world and all the Foundation Year students. This blog introduces the possibility to enjoy and study a variety of subjecs investigated in the course of ever changing classic and contemporary design themes. It presents research, opinion and reflection in a variety of forms. Design.nl is a wide focuses blog about Dutch Design, from interviews with Dutch Designers to inspiration, showcases and more. It also holds a great calendar with Dutch happenings in design. Frequently updated with news and information. The Graphic Design Museum in Breda, The Netherlands. Here you’ll find visionary statements about the changing position of the graphic design discipline. Visuals and slogans, stories behind the objects in our collection, essays about the subjects of our exhibitions and some of our favorite graphic design resources on the web. 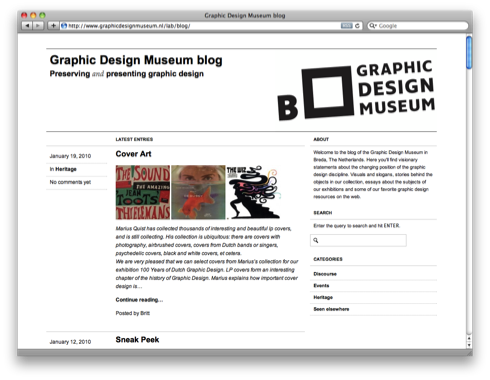 The Graphic Design Museum is the first museum in the world for graphic design. The museum is in the centre of Breda and exhibits the broad and dynamic area of graphic design. Really worth the visit when you are in The Netherlands, Breda. NAGO holds the largest Dutch Archief on graphic design, designers and design agencies from the Netherlands. NAGO is an exceptional resource for what Dutch Designers created over the last decades. With a good search functionally you are able to search for arists, work, technique and more. 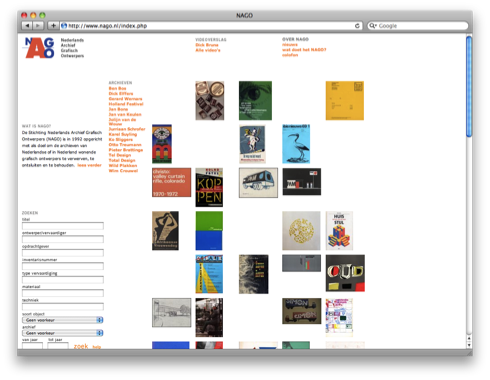 When browsing NAGO you really get a good feeling of Dutch Design and Art. 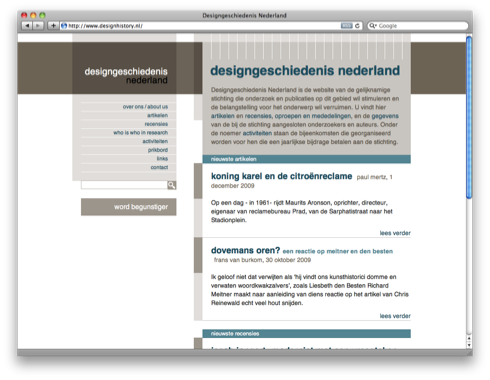 Design History NL is the website of the Dutch foundation that encourages research and publications about design history. The foundation also organizes meetings, lectures, conferences and other activities for participants: design historians, authors and those who are interested in the subject. You will find information about their research in who is who in research. 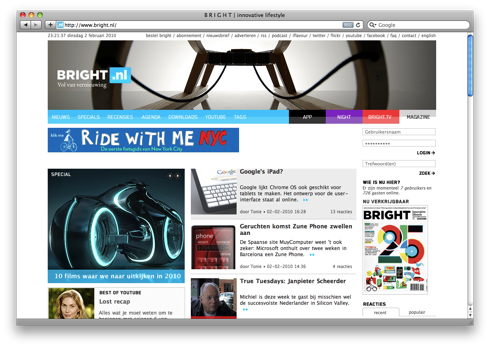 Bright Magazine is an offline and online platform which shows you the latest information about design, technology, gadgets and more. The online magazine is an constant update of information and if you can find the printed magazine be sure to get a copy, great content. They also hosts tv series where the latest gadgets are reviewed, very funny and educational. Hollands largest website about Dutch Architecture and everything involved around design, production, events in relation to architecture. 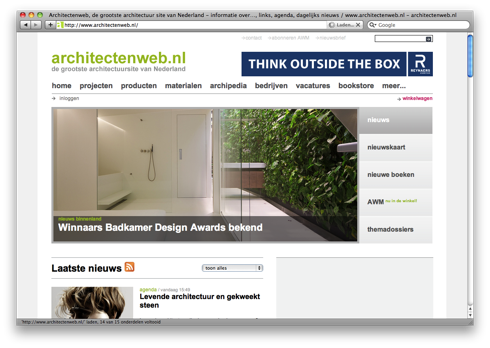 Daily updated with architecture projects in The Netherlands. 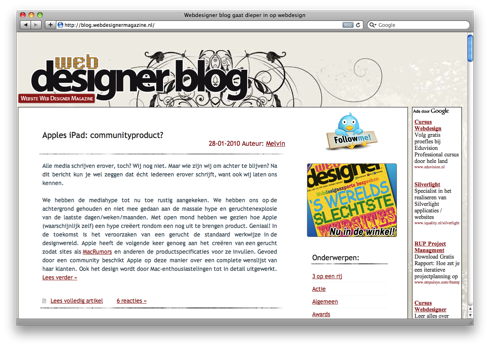 Web Designer Magazine is an online and offline plaform for Dutch web designers. 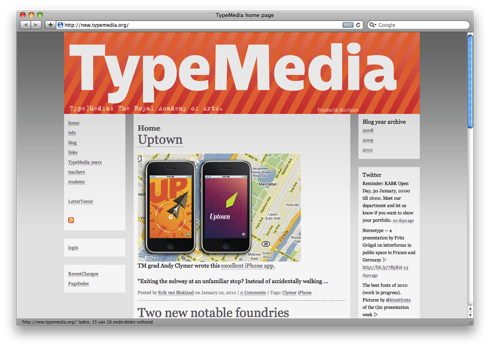 TypeMedia is a one year master course in type design, the blog hosts articles from students and teachers. Operated by Dutch Type designers such as Erik van Blokland, Fred Smeijers and Peter Verheul.